Height: 5'5" Weight: 120 lbs. I went to Glendale High School in Glendale, CA (near Pasadena "Rose Bowl") There I ran Cross Country for 3 years with a best time of 21:00 for the 3 mile. I also competed on the Track & Field team for 4 years. My favorite event by far was the Pole Vault and my best was 8'6". I really can't tell you which sport I liked better, because I loved both of them so much. In Cross Country, I was always the one with the stronger kicks, the faster intervals, the power. Then in Track I was usually the one who could last the whole workout through without giving up. I was probably fit for those middle distances, even though I loved every event. I actually tried at least ten of the sixteen events at one time or another, but only really trained consistently for the Pole Vault. My favorite thing about Cross Country was the Annual Summer Mammoth Running Camp I attended twice. The scenery, the trails, the road trip away from home, and the bonding with other schools made it so worthwhile! The best part of Track was Pole Vault and just having the opportunity, the mere chance, to fly through the air, feel an upward force and just get that perfect vault! Unfortunately, I experienced a drammatic 3rd degree ankle sprain while pole vaulting during my Track season, spring of senior year. I have yet to return to my old training routine of running or working out every day. College is so distracting and there are so many new things. Starting this summer, I plan to make a new effort to run again and hopefully get some speed to try the pole vault come next fall. I would love to meet some motivated and inspiring Bruins and find a new running partner or two. Interests: Space, History, The Outdoors (fishing,hiking, etc...). 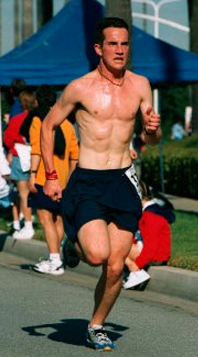 Quote: "I ran until my muscles burned, until my veins pumped battery acid. Then I ran some more." I first heard about Bruin Runners from Kim Treebs, the president, who was in my chemistry class fall quarter. I ran cross-country my last two years of high school and I had continued my running at UCLA. However, it is extremely hard to get motivated when you run by yourself. That is why I felt the running club would be a great thing to get involved in -- and it was. But the great thing about running club is that it is not just about running, but also about making friends. The people I have met through the running club are awesome. I always look forward to running because we all have such a fun time together. I encourage anyone -- whether you are just starting to run or whether you're running marathons -- to become a part of the BruinRunners Club! Quote: "Hey Dirty, Baby, I gotcha money"
Height: 6'2" Weight: 165 lbs. Ran cross-country and track my Junior and Senior years in HS. New passion: ultra running I'm a beginning ultra runner. I am not ultra compared to the 40 and 50 year olds who mainly run these, but I am ultra compared to every single bruin runner. They are hard-core, I AM ULTRA. -Didn't run in HS, only ran recreationally, in the afternoons, 3-4 times a week, 3 miles on the average. Height: 5'8" Weight: 140 lbs. My quote: Running's never been the hard part for me, it's not running that I have trouble with. Quote: "Don't let your reality limit your reality."